nThe city is historically known for its beach where the hard-packed nsand allows motorized vehicles to drive on the beach in restricted nareas.n This hard-packed sand made Daytona Beach a mecca for motorsports, and the old Daytona Beach Road Course hosted races for over 50 years. This was replaced in 1959 by Daytona International Speedway. The city is also the headquarters for NASCAR. 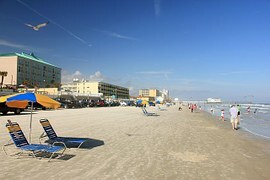 nDaytona Beach hosts large groups of out-of-towners that descend upon the city for various events, notably Speedweeks in early February when over 200,000 NASCAR fans come to attend the season-opening Daytona 500. Other events include the NASCAR Coke Zero 400 race in July, Bike Week in early March, Biketoberfest in late October, and the 24 Hours of Daytona endurance race in January. Daytona is an amazing place to live for many reasons. One of the many reasons I love Daytona is simply because it is centrally located to a variety of fun things to do. For starters, Orlando is only an hour away if you feel like seeing Micky Mouse and visiting the other parks or venues Orlando has to offer. You also have amazing fresh water spring in Ocala nearby! The springs are a must see as they are just like being in a tropical paradise! If you prefer to stay in the area the list of activities is endless. From boating and fishing to surfing and parasailing (and just about any other water sport you can think of) there is sure to be something for everyone. 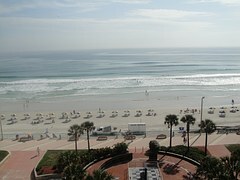 If this wasn't enough, Daytona boasts numerous events such as festivals, concerts, and art shows. You won't be disappointed! 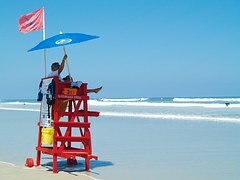 Daytona is a great place to retire, to own a vacation home, or to re-locate and start a family. You will be glad you made the move! Daytona has something to offer someone at any age and with a variety of interests. The home prices and taxes are amazing for all that the area has to offer. Updated: 23rd April, 2019 10:56 AM.